Two veteran writers collaborate on this fascinating behind-the-scenes account of the journey that took the “practically perfect” nanny from the pages of P. L. Travers’s beloved novels to the stage. 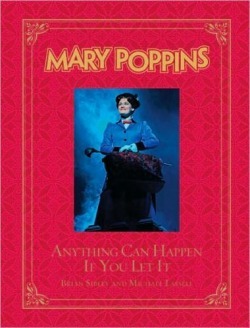 Well-known British writer and radio personality Brian Sibley tells Mary Poppins’s story, from her obscure origins in Travers’s Australian childhood and her progress through the series of books Travers began to write in 1934, to her incarnation by Julie Andrews in one of the most successful Disney films of all time, to her long-awaited landing onstage in London’s West End. A long-time friend of Travers and co-writer with her of an unproduced sequel to the film, Sibley offers unique insights into the idiosyncratic author’s complex relationship to her heroine, and the decades-long series of proposals and negotiations that finally resulted in Disney Theatrical Productions joining forces with the Cameron Mackintosh Theatrical Group to realize Travers’s stories as a spectacular work of musical theater. Sibley’s details the entire development process of the show’s script, music, choreography, and design, culminating in a glorious opening night on December 15, 2004 in London’s Prince Edward’s Theatre, as Mary Poppins is met by cheering sold-out houses and critical raves. In the book’s second half, Michael Lassell gives a fascinating backstage account of the show’s transfer to Broadway, including the show’s American casting and important changes to its book, lyrics, and designs, as the creative team strives to “plus” Poppins to perfection.